Slide Show Notes Welcome to material safety data sheet training. This training is designed for those who work with hazardous chemicals. If there are hazardous chemicals in your workplace, you need to know about the material safety data sheet, commonly known as the MSDS. This important document reveals the hazards of the chemicals you work with and describes the precautions you need to take to keep safe and healthy. The MSDS can be a real lifesaver. That’s why you need to know as much as possible about how to use it. 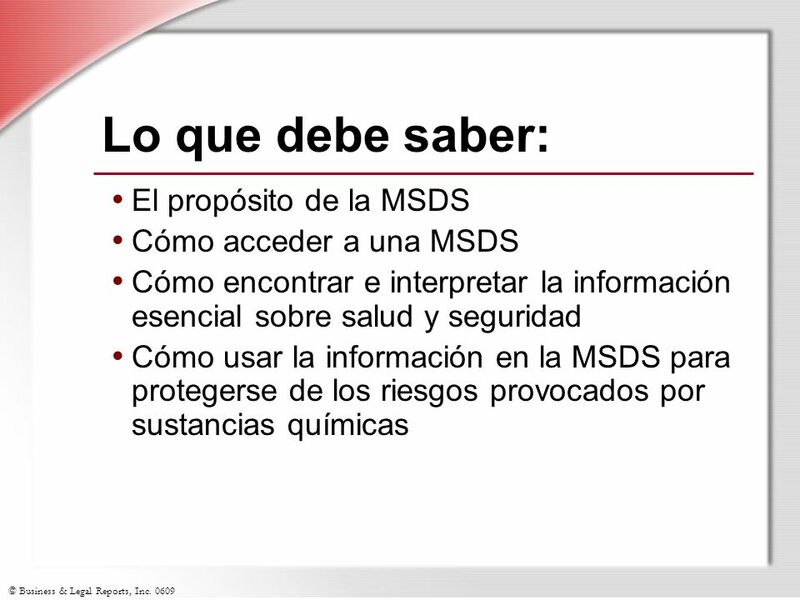 Reconocer la importancia de las MSDS Tener acceso a una MSDS Localizar la información esencial sobre salud y seguridad Interpretar la información con exactitud Slide Show Notes The main objective of this session is to teach you how to use the MSDS to protect yourself and others from chemical hazards. By the time the session is over, you should be able to: Recognize the importance of the MSDS; Access an MSDS; Locate essential safety and health information; and Interpret the information accurately to protect yourself and others from the hazards of the chemical. 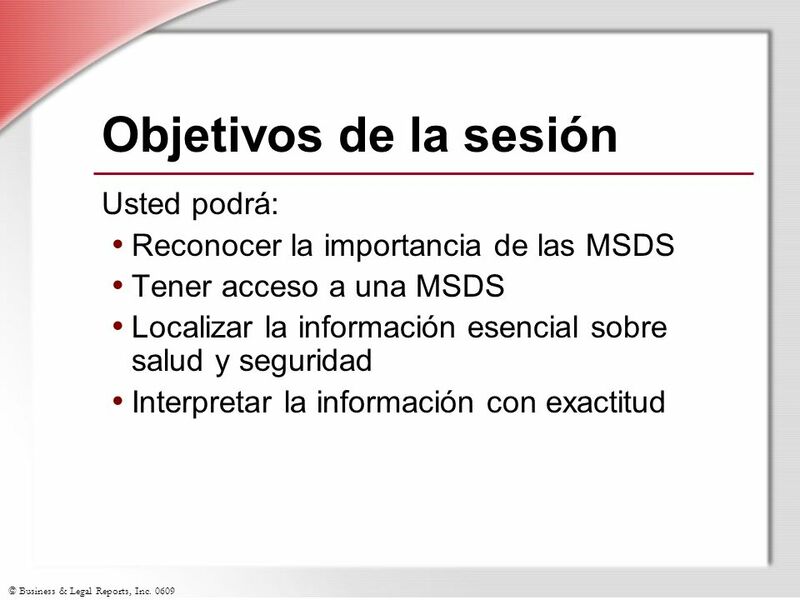 Cómo encontrar e interpretar la información esencial sobre salud y seguridad Cómo usar la información en la MSDS para protegerse de los riesgos provocados por sustancias químicas Slide Show Notes During the session, we’ll discuss: The purpose of the MSDS and how it fits into our Hazard Communication Program; How to access an MSDS; How to find and interpret essential safety and health information; and How to use MSDS information to protect against chemical hazards. 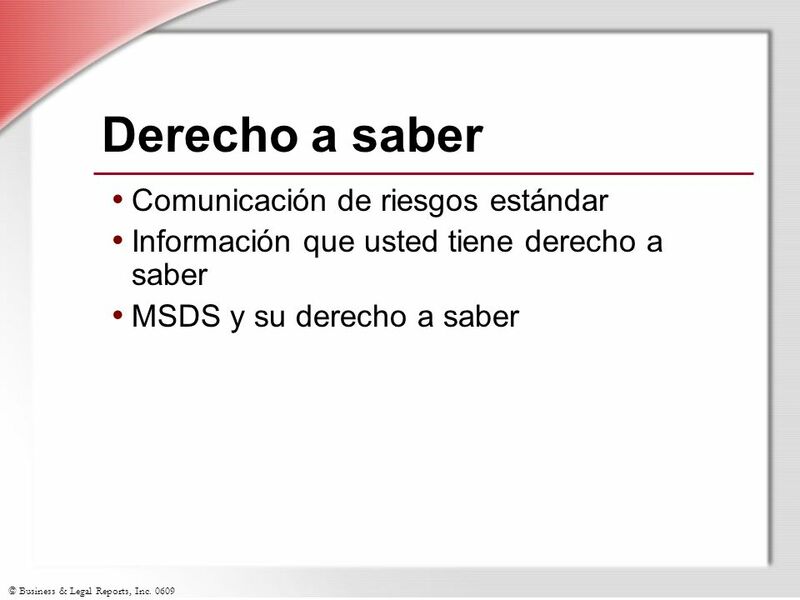 Información que usted tiene derecho a saber MSDS y su derecho a saber Slide Show Notes OSHA says that you have a right to know about chemical hazards in the workplace. OSHA’s Hazard Communication Standard—also known as the “right-to-know” law—is based on the idea that you have a right to know about hazardous chemicals you use on the job and a need to know how to work safely with those chemicals. Right-to-know information is communicated in a number of ways, including the MSDS, container labels, warning signs, and safety training sessions like this one. The MSDS is the key to all this information because the information found on labels, on signs, and in training is typically based on the information found in the MSDS. There is an MSDS for each hazardous chemical in the workplace. Think about the chemicals you use on the job. Do you consult the MSDS for each chemical before you use it? Ask trainees to identify the chemicals they use on the job. Ask for a show of hands for how many consult the MSDS before they use a chemical. How many consult it if they have questions about a hazard or a precaution concerning the use, storage, or disposal of a chemical? 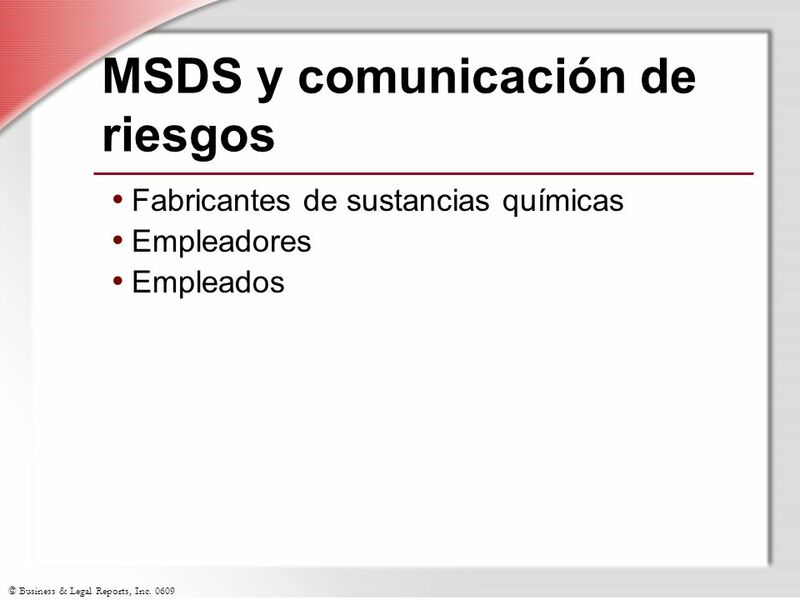 Fabricantes de sustancias químicas Empleadores Empleados Slide Show Notes Chemical manufacturers, employers, and employees all play a role in the use of the MSDS for chemical safety. Chemical manufacturers must determine the hazards of the chemical products they make and provide an MSDS for each product. The Hazard Communication Standard also requires manufacturers to label chemical containers. We must make the MSDS available to all our employees and train you to understand the hazards of the chemical and the precautions you need to take to prevent injuries and illness. We must also identify and label hazardous material containers and have a written Hazard Communication Program. You, the employee, must read the MSDS so that you can identify chemical hazards and understand how to work safely with the chemical. You are also required to read the labels on chemical containers before using chemicals. And you must also follow the company’s instructions and warnings, and participate in Hazard Communication Program training. Are you familiar with our Hazard Communication Program? Briefly review your Hazard Communication Program. 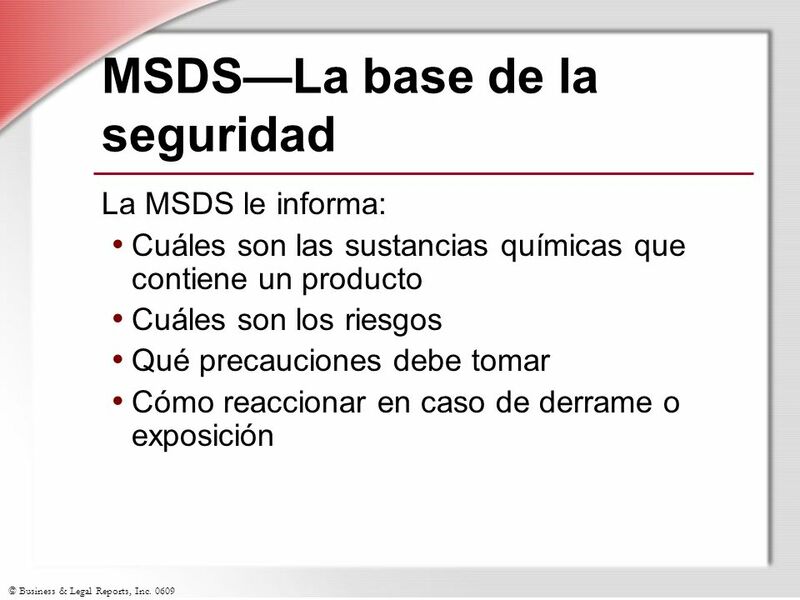 La MSDS le informa: Cuáles son las sustancias químicas que contiene un producto Cuáles son los riesgos Qué precauciones debe tomar Cómo reaccionar en caso de derrame o exposición Slide Show Notes As you can see, the MSDS is really the foundation for working safely with chemicals. It is your best source of information about: What chemicals are contained in a product; What hazards you could face when you use that product; What precautions you need to take to keep safe; and What to do in the event of a spill or exposure involving a hazardous chemical. 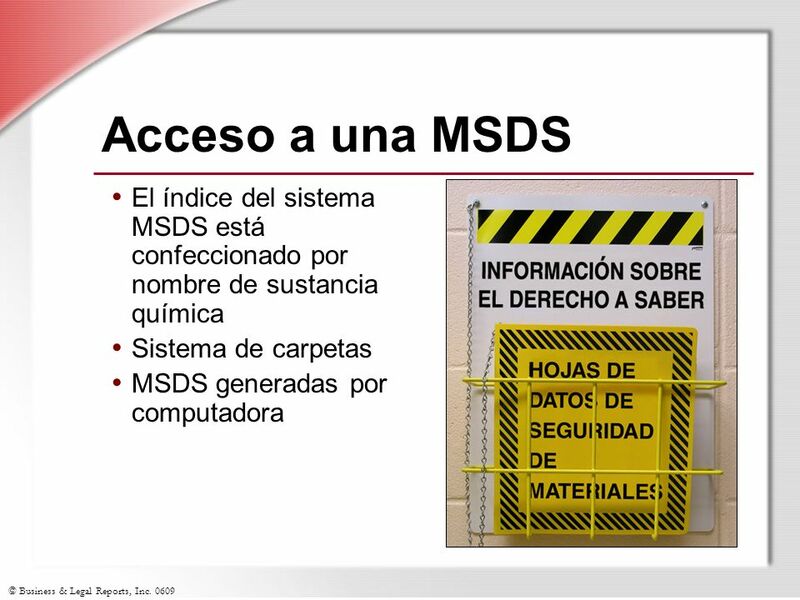 7 Acceso a una MSDS El índice del sistema MSDS está confeccionado por nombre de sustancia química Sistema de carpetas MSDS generadas por computadora Slide Show Notes The Hazard Communication Standard requires employers to provide access to MSDSs at all times. OSHA permits different systems for accessing MSDSs, as long as the system provides easy 24-hour-a-day access. For example: Facilities are required to keep a list of all hazardous chemicals in the workplace as part of their Hazard Communication Program. This list can be used as an index to an MSDS file system. A binder system could be used. The MSDSs may be stored alphabetically, by chemical type, or assigned an in-house number that is referenced in the index. These binders must be kept in a place where they can be accessed on all shifts. OSHA also allows the use of computer-based MSDS systems that use CD-ROMs or company intranets that allow you to call up an MSDS on the computer screen and print out hard copies. Do you know how to access MSDSs for the chemicals you work with? Discuss the specifics of your MSDS system and how trainees can access an MSDS in your workplace. Have one or two trainees demonstrate how to look up or find an MSDS. 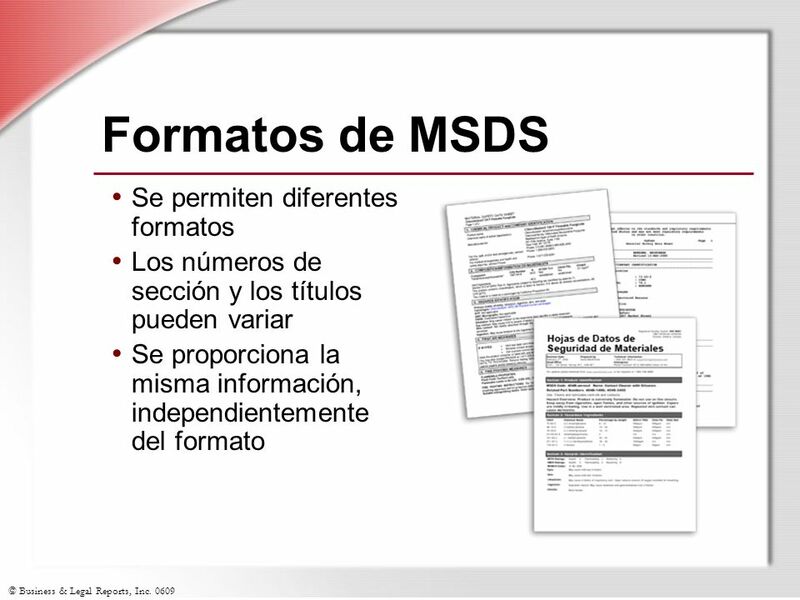 Los números de sección y los títulos pueden variar Se proporciona la misma información, independientemente del formato Slide Show Notes The right-to-know law does not require a standard format for MSDSs. Chemical manufacturers can decide how required information is arranged in the document. That means MSDSs may have a different number of pages, different section titles, or even different number of sections. In the past, most MSDSs had 8 sections. Back in 1985 OSHA established this format as a voluntary guide to assist chemical manufacturers in organizing MSDS information. Recently, however, OSHA has recommended a different format designed some years back by the American National Standards Institute, also known as ANSI. The ANSI MSDS has 16 sections and is more organized and comprehensive than the 8-section format. OSHA recommends the ANSI format because it makes it easier to find information. 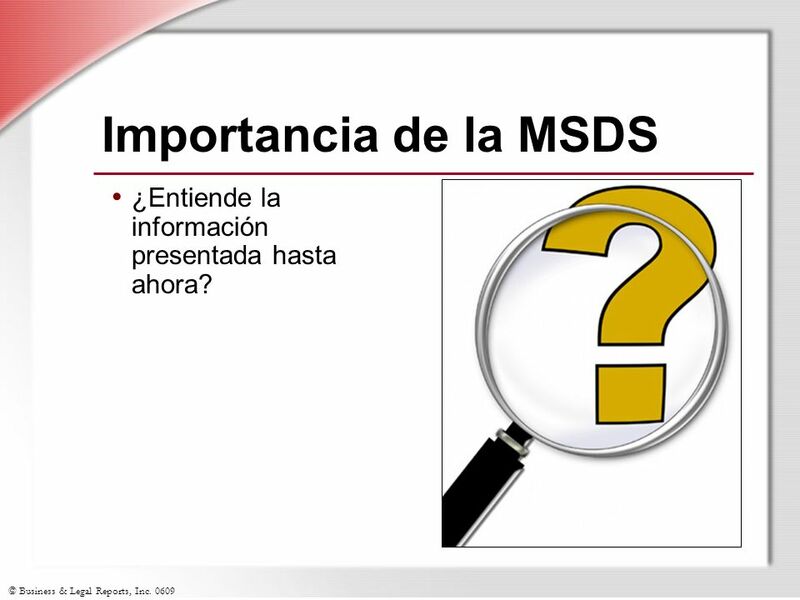 Regardless of format, however, the same basic safety and health information is provided in all MSDSs. Think about the MSDSs you have used. Were they all in the same format or are you familiar with different formats? Show trainees samples of different MSDS formats, if appropriate. 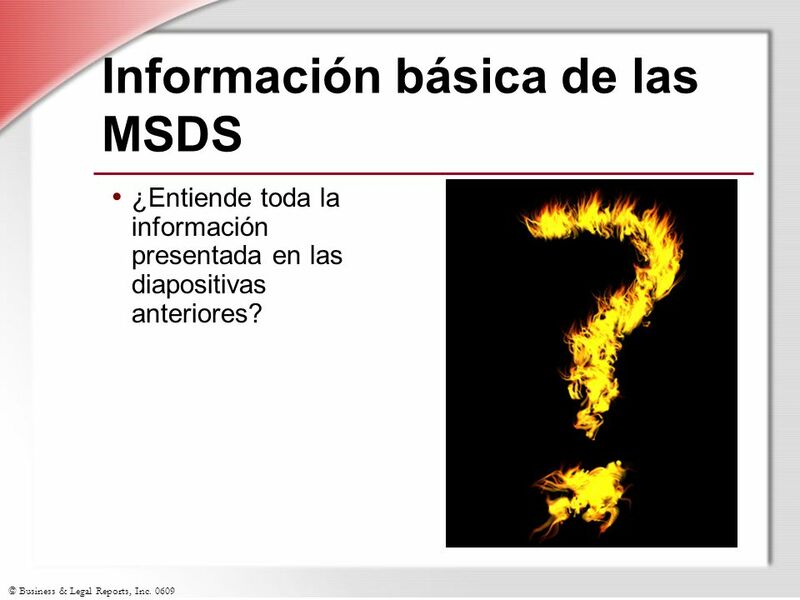 9 Importancia de la MSDS ¿Entiende la información presentada hasta ahora? Slide Show Notes Now it’s time to ask yourself if you understand the information presented so far. Working with chemicals, you need to understand the purpose and the importance of the MSDS. You must also know how to access an MSDS when necessary. Answer any questions trainees have about the information presented in the previous slides. Conduct an exercise, if appropriate. Now let’s move on to the specific information you can find in an MSDS and how you can use this information to protect your safety and health. 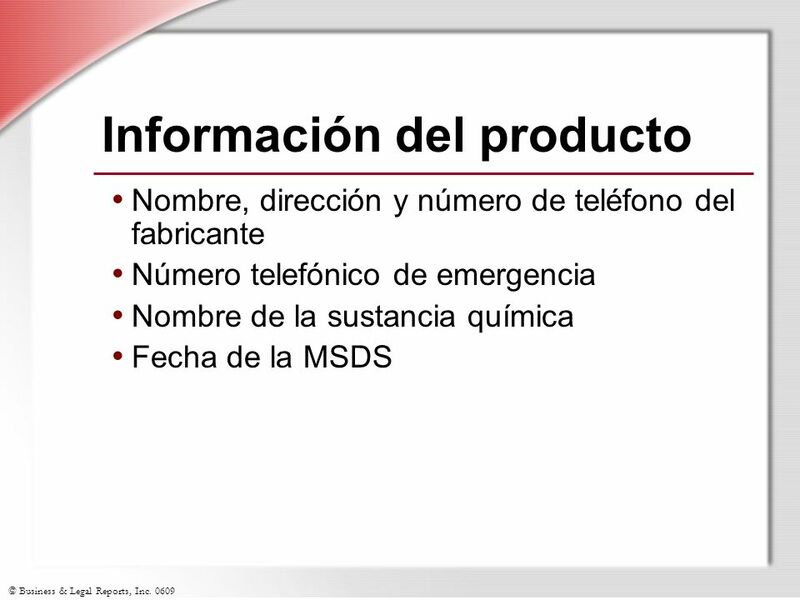 Nombre, dirección y número de teléfono del fabricante Número telefónico de emergencia Nombre de la sustancia química Fecha de la MSDS Slide Show Notes The MSDS always contains the manufacturer’s name, address, and phone number so you can contact the manufacturer if you have questions about the chemical. It also provides an 24-hour emergency number where you can ask questions about chemical spills or exposures. Doctors who are treating workers who were overexposed to a chemical can also use the number. The name of the chemical will also be listed. Sometimes this will be a specific chemical name such as “acetone” or “sulfuric acid.” Some manufacturers may use the brand name of the chemical. Sometimes manufacturers give chemical products a product number. These names and numbers will help you match the MSDS with the container label to make sure you have the right MSDS. The date of the MSDS will also be listed. This is important because you don’t want to use an old, out-of-date MSDS. The manufacturer may have changed the formula for the product or new safety information about a chemical might have recently become available. 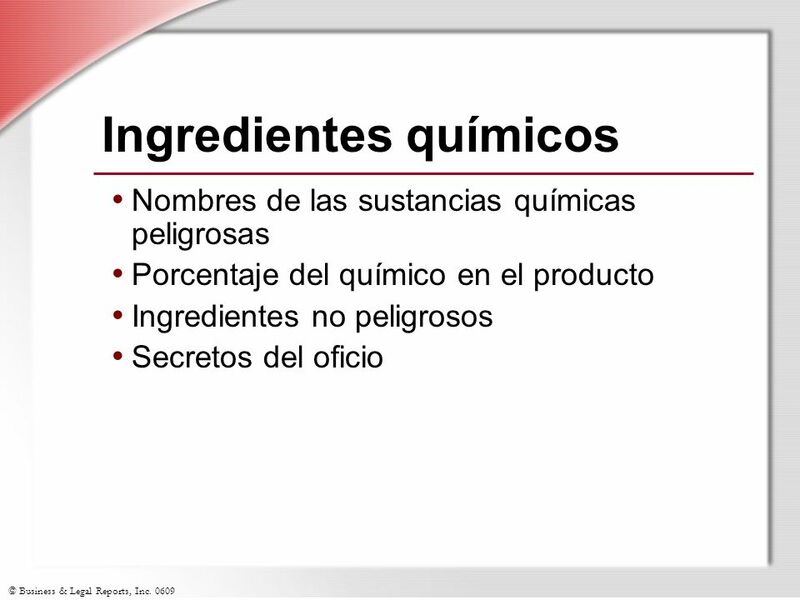 Nombres de las sustancias químicas peligrosas Porcentaje del químico en el producto Ingredientes no peligrosos Secretos del oficio Slide Show Notes The MSDS will also list product ingredients. Any chemical that has been identified as hazardous will be named. Basic products may have one or two hazardous ingredients. Complex products might have numerous ingredients. The MSDS will also give you an idea of how much of each hazardous ingredient is contained in the product. A range is often provided, such as 10 percent to 20 percent or less than 5 percent. Nonhazardous ingredients might also be listed. However, the MSDS may state that the remaining ingredients in the product are nonhazardous, without specifically naming them all. Occasionally, a manufacturer will not name a hazardous ingredient because it is a trade secret. Instead of giving the chemical’s name, the MSDS will state “trade secret.” The manufacturer still has to provide information on the trade secret chemical, such as hazards, safety information, and first-aid procedures. Think about a chemical product you use on the job. Do you know the hazardous ingredients of that product? Review the hazardous ingredients listed in the MSDS for a common chemical product used by trainees. 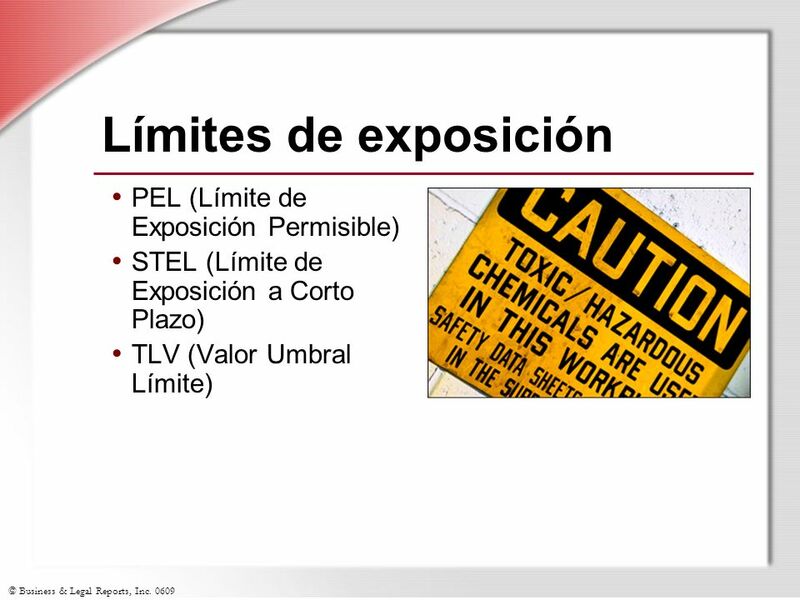 STEL (Límite de Exposición a Corto Plazo) TLV (Valor Umbral Límite) Slide Show Notes The MSDS also provides information about exposure limits for each hazardous ingredient. The exposure limit is similar to taking medicine. If you take two pills when the doctor prescribed one every 8 hours, you would be overdosing. If you exceed chemical exposure limits, you are basically overdosing, which could endanger your health. You’ll find three exposure limits on an MSDS—Permissible Exposure Limit or PEL, Short-Term Exposure Limit or STEL, and Threshold Limit Value or TLV. PEL is the value set by OSHA for an 8-hour day. If exposure to a chemical concentration, averaged over an 8-hour day, is greater than the PEL, you are being overexposed. STEL is the maximum chemical concentration that you can be exposed to in a 15-minute period. TLV is similar to PEL. Usually the two values are the same. However, when they differ, the lower number is used to determine the exposure limit. If exposure to a chemical is greater than those listed, we need to evaluate engineering controls, such as ventilation, to reduce your exposure. If that’s not enough, you will need to wear PPE. 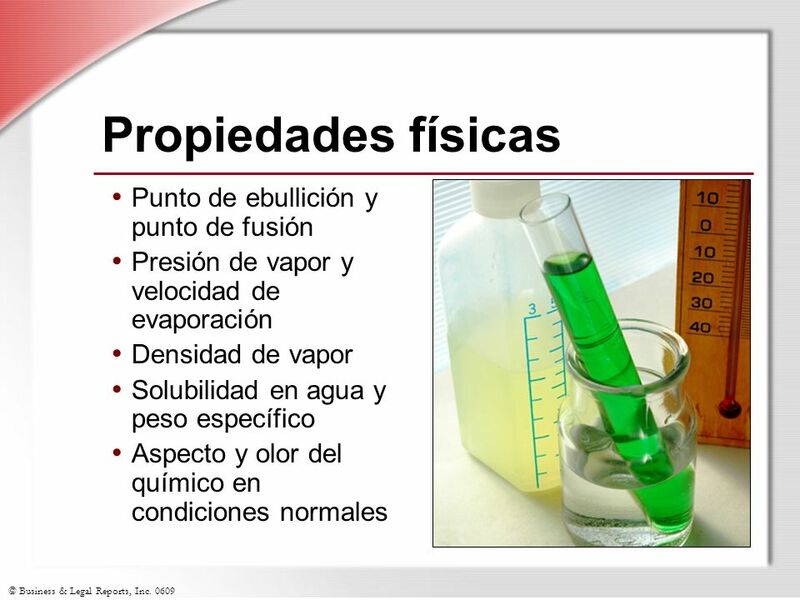 Presión de vapor y velocidad de evaporación Densidad de vapor Solubilidad en agua y peso específico Aspecto y olor del químico en condiciones normales Slide Show Notes The MSDS will also include information about a chemical’s physical properties. This information might at first look pretty scientific, but actually it is very basic and important. This information will tell you what conditions could change a chemical’s form, which could affect the type and degree of the chemical’s hazard. For example, the boiling and melting points tell you at what temperature the material will change from a liquid to a gas or from a solid to a liquid. Vapor pressure and evaporation rate tell you how fast a chemical will put vapors into the air. The higher the vapor pressure, the faster the chemical will evaporate. If those vapors are flammable or toxic, this is important information to know. Vapor density describes whether chemical vapors will rise or stay close to the ground. Vapor density below 1 will rise, and density above 1 will stay close to the ground, possibly creating hazardous environments. Solubility refers to whether a chemical will dissolve in water. Specific gravity tells you whether a substance will sink or float in water. The MSDS will also tell you how the chemical should look and smell under normal conditions. 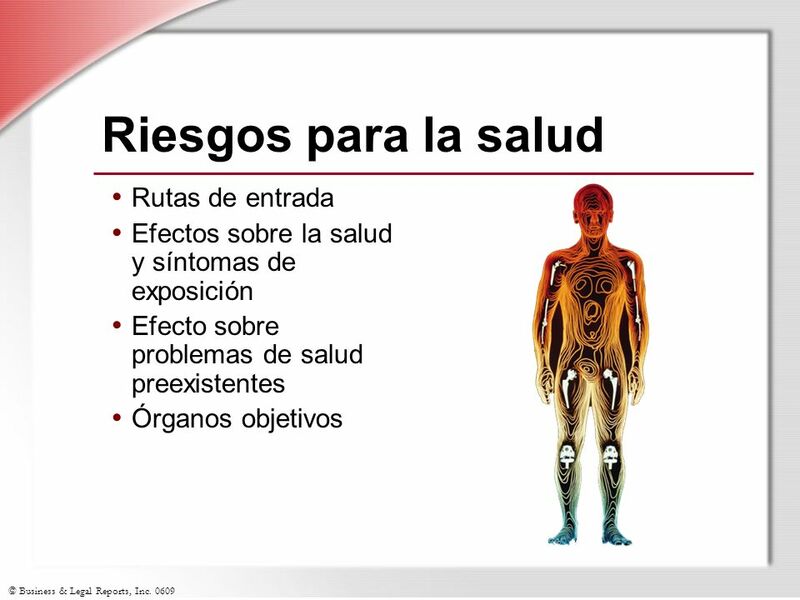 Efectos sobre la salud y síntomas de exposición Efecto sobre problemas de salud preexistentes Órganos objetivos Slide Show Notes The MSDS will list the health hazards of a chemical as well. First of all, the MSDS will explain routes of entry—that is, how a chemical can get into your body. Basically, there are three routes of entry. A chemical vapor can be inhaled. If a chemical is on your hands and you touch your mouth, you could accidentally swallow some. A chemical can also get into your body through skin or eye contact. The MSDS will also describe the health effects of exposure. “Acute” effects are those that occur shortly after exposure and begin to disappear once you are removed from exposure. Examples include skin or eye irritation, headache, or nausea. “Chronic” health effects are those that develop as a result of years of exposure. Examples include sensitization, allergies, lung or liver damage, and cancer. Many chemicals also affect existing medical conditions such as asthma or high blood pressure. The MSDS will generally indicate if chemical exposure could aggravate an existing medical condition. It may also list specific body organs that may be targeted by the chemical. For example, a chemical may do damage to your liver, kidneys, or lungs if you are overexposed. 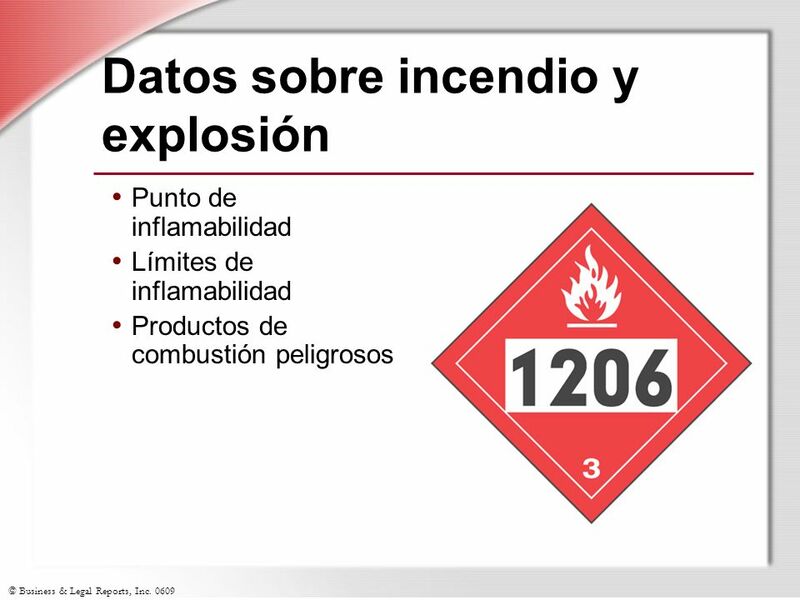 Punto de inflamabilidad Límites de inflamabilidad Productos de combustión peligrosos Slide Show Notes An MSDS will also tell you how likely a chemical is to catch fire—and under what circumstances. It will also explain how quickly a fire might spread or how likely it is that the fire could lead to an explosion. The MSDS will tell you a chemical’s flashpoint. Flashpoint is the temperature at which a liquid gives off enough vapors to burn. If a solvent has a flashpoint of 50 degrees Fahrenheit, for instance, its vapors could easily ignite and burn at room temperature. The MSDS will also identify a chemical’s upper and lower flammability limits, or the range of concentration in the air that can readily catch fire. Concentrations above or below this range are less likely to burn. When a chemical burns it will often give off hazardous or irritating compounds such as smoke, carbon monoxide, and other toxic fumes. You need to know about these hazardous combustion products in the event of a chemical fire. Think about the chemicals you use. Do you know about their flashpoint, flammability limits, and hazardous combustion products? Review fire data from an MSDS of a commonly used chemical. 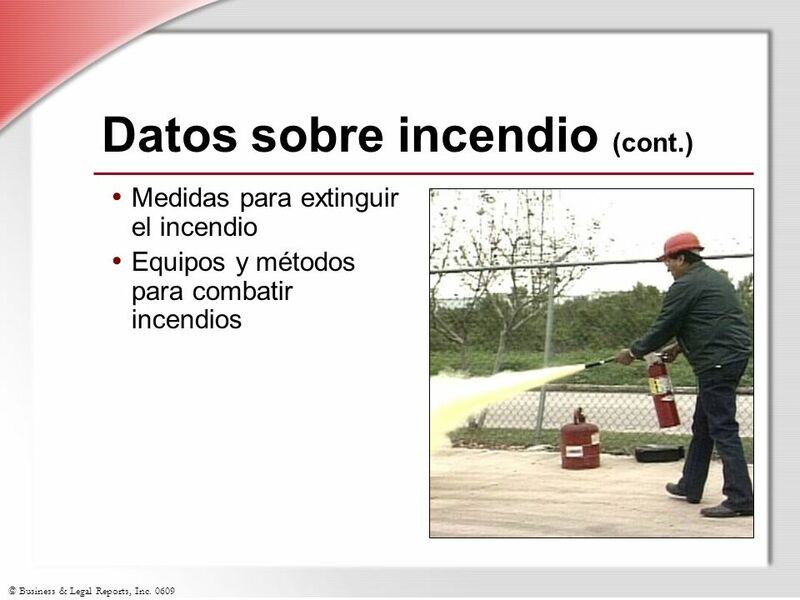 Medidas para extinguir el incendio Equipos y métodos para combatir incendios Slide Show Notes The MSDS will also identify proper measures for extinguishing a fire involving the chemical—for example, water, foam, or other extinguishing medium. Trying to extinguish a fire using the wrong medium can have disastrous results. And the MSDS will additionally list firefighting equipment and methods. This information is reserved for firefighting professionals who are properly trained. That means the MSDS should always be provided to firefighters who are responding to a chemical fire in your workplace. Do you know the right type of fire extinguisher for the fires involving the chemicals you work with? You should. Have trainees identify the chemicals they use. Then, for each chemical identified, explain what type of extinguisher and extinguishing medium should be used in case of fire. 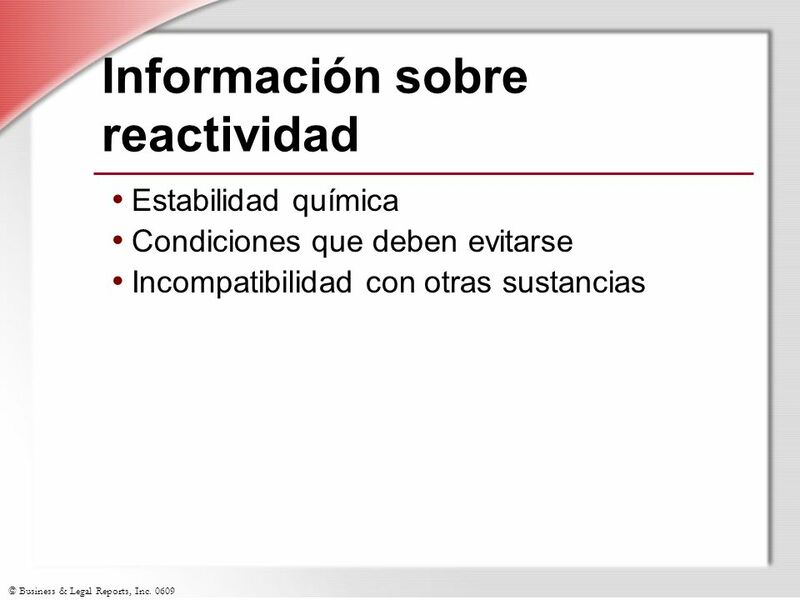 Estabilidad química Condiciones que deben evitarse Incompatibilidad con otras sustancias Slide Show Notes Another important block of information contained in an MSDS involves reactivity data. This information alerts you to conditions that could cause a chemical to have a potentially hazardous reaction. The MSDS will describe the chemical’s stability, which is how it might change when subjected to different conditions, such as a change in temperature, a change in pressure, or shock when a chemical container is dropped or struck. The MSDS will also identify conditions to avoid. These are conditions that could cause the chemical to become unstable. You’ll encounter terms such as “avoid freezing,” “avoid high temperatures,” “avoid sparks or open flames,” or “do not drop.” Finally, the MSDS will provide information about incompatibility with other substances. Descriptions might include “avoid contact with strong acids,” “keep away from strong oxidizers such as hydrogen peroxide,” or “reacts violently with water.” This information helps you understand which chemicals should not be stored or worked with in the same area unless, of course, the reaction is intended as part of a process. 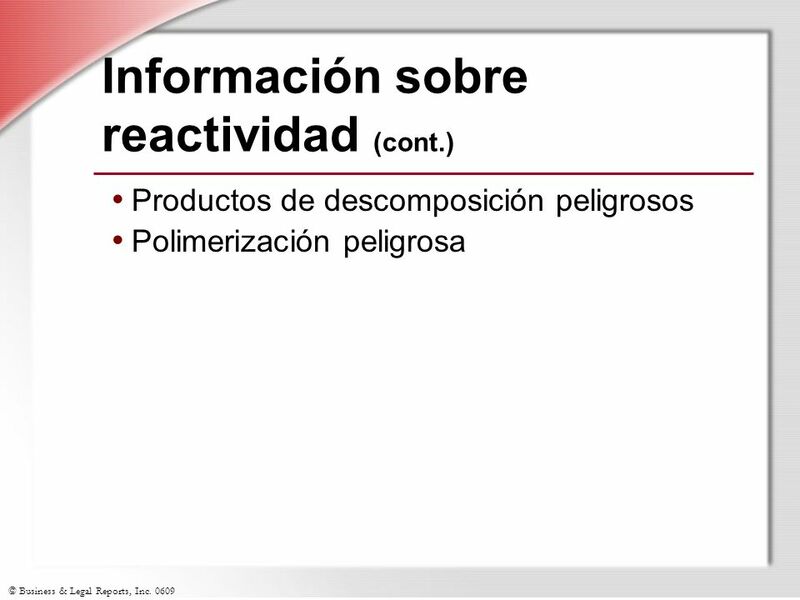 Productos de descomposición peligrosos Polimerización peligrosa Slide Show Notes The MSDS will also tell you about hazardous by-products that could result when the chemical decomposes. Some hazardous chemicals can create new hazardous substances as they react or break down, which means new hazards you have to protect yourself against. The MSDS might also discuss “polymerization.” Polymerization is the ability of a substance to react with itself and release heat or explode. Most chemicals will not polymerize. But some may when conditions change, such as when exposed to heat. Again, this is important information to have on hand. Think about the chemicals you use. Do you know how they might change when subjected to different conditions? Do you know conditions to avoid and the chemicals' incompatibility with other substances? Review reactivity data from an MSDS of a commonly used chemical. 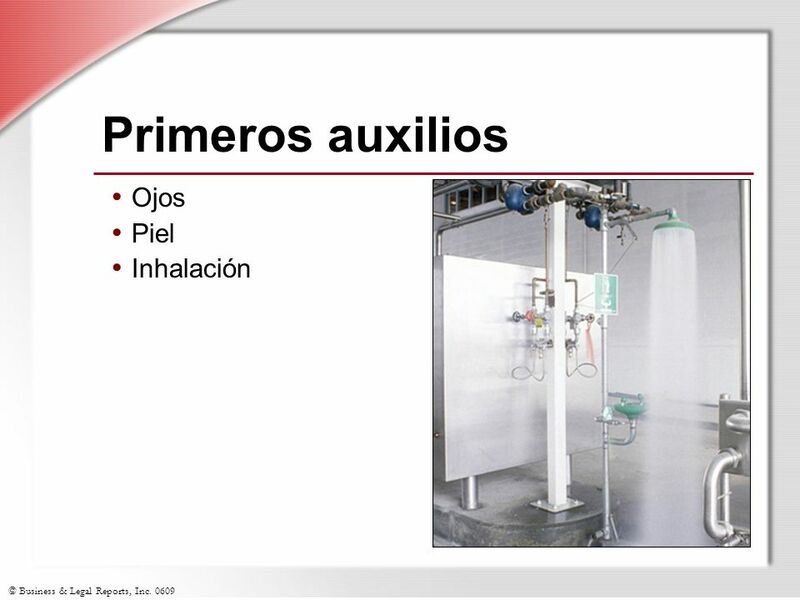 Recomendaciones de almacenamiento Requisitos de suministro Slide Show Notes Safe handling precautions are a very important part of any MSDS. If not handled, stored, and disposed of properly, many chemicals create serious hazards. Storage recommendations on an MSDS might include such items as: Keeping containers tightly closed when not in use; Storing the chemical in a cool place, away from moisture; Keeping the chemical in a well-ventilated area or an area with secondary containment; or Making sure the containers are grounded or kept in a room with explosion-proof lighting or electrical fixtures. Dispensing chemicals can also be dangerous, particularly when dispensing flammable substances that could be ignited by a simple spark created by the buildup of static electricity. The MSDS will detail dispensing requirements, such as proper grounding and bonding of containers and the use of sparkproof tools around the chemical. The MSDS might also recommend the type of pump to use when dispensing the chemical or the materials the pump or dispensing hoses should be made of. 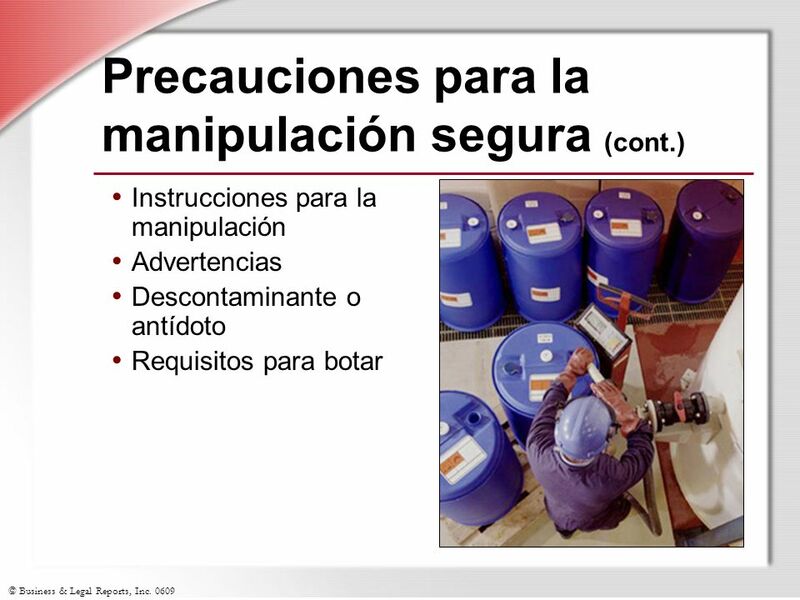 Instrucciones para la manipulación Advertencias Descontaminante o antídoto Requisitos para botar Slide Show Notes The MSDS will also provide safe handling instructions. For example, it might suggest work procedures, such as: “Avoid skin contact with material”; “Use only in well-ventilated areas”; or “Do not drop—shock sensitive.” The MSDS will also give warnings such as “product on surface will create slippery conditions” or “heated product may give thermal burns.” The MSDS may additionally advise having a decontaminant available for spill response and an antidote for worker exposure. Finally, the MSDS might also provide some information regarding the proper way to dispose of chemical waste materials. When available, these data will explain how the chemical is classified and identified for proper disposal. And they will describe any special instructions or limitations about disposal. Think about the chemicals you use. Are you familiar with all the safe handling requirements in the MSDS? Review safe handling requirements from the MSDS of a commonly used chemical. Slide Show Notes Exposure control is another safety issue addressed by the MSDS. Before relying on PPE to protect you and your co-workers, OSHA requires the company to evaluate the use of engineering controls to reduce the risk of exposure to a chemical. 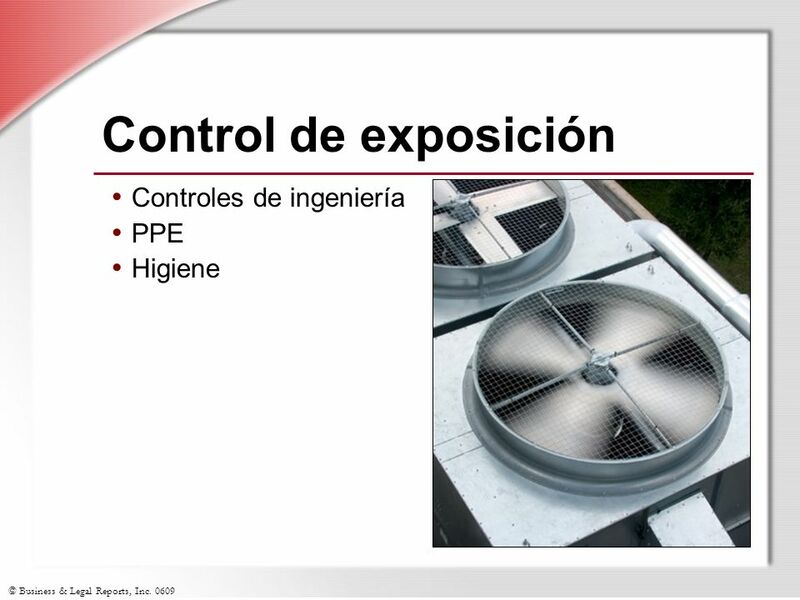 Engineering controls include: Ventilation systems; Vapor extraction systems; Dust control systems; and Mechanical methods for dipping and coating operations. 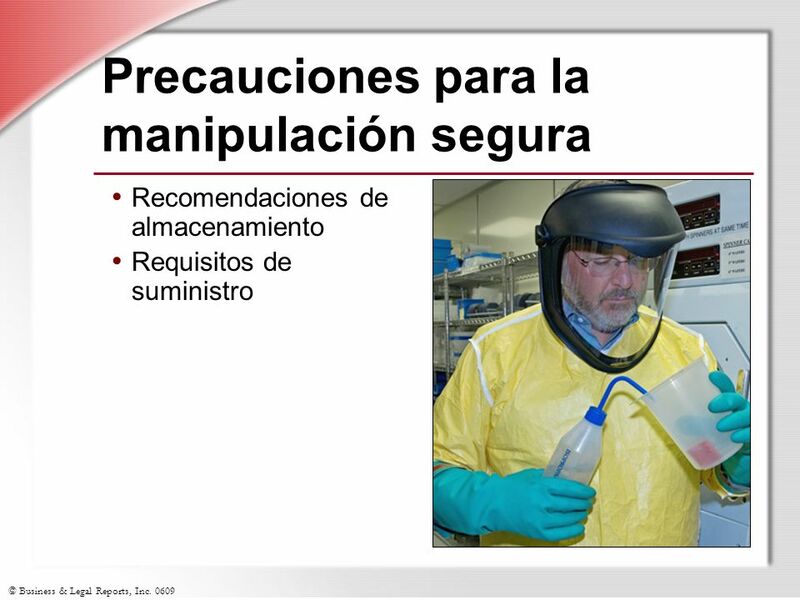 When engineering controls can’t eliminate chemical hazards, appropriate PPE is required to protect you from exposure. The MSDS will describe the type of PPE required. For example: Goggles when working with dust or liquids; Face shields when using chemicals in a potential splash situation; Specific skin protection, such as gloves and protective clothing; and Respiratory protection when ventilation is inadequate. The MSDS will also indicate hygiene practices to follow to prevent exposure. 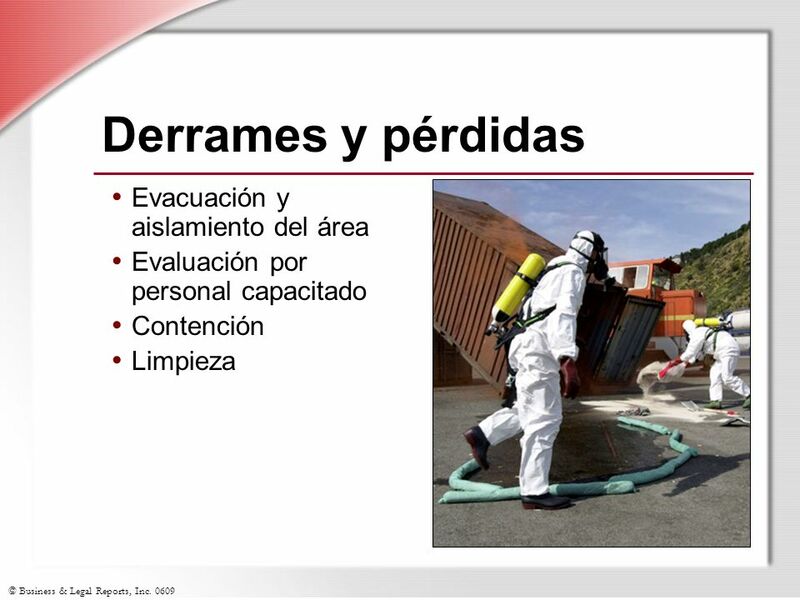 Evaluación por personal capacitado Contención Limpieza Slide Show Notes MSDSs also provide information about what to do in the event of a chemical release—for example, a spill or a leak. Almost every hazardous substance spill requires personnel to evacuate and isolate the area either because of health hazards, such as respiratory concerns, or because of physical hazards, such as slippery surfaces or the danger of fire. At that point, specially trained and equipped personnel need to come in to evaluate the scene and determine how to respond safely to the spill. The MSDS will explain necessary measures to contain and stop the release. Responders will follow instructions in the MSDS about appropriate spill containment materials and methods. The MSDS will also describe how the spill should be cleaned up and may also provide guidance concerning safe disposal of materials. Think about what you should do in the event of a spill or leak of hazardous chemicals. Discuss your facility’s chemical release response procedures, including how to report spills and leaks, and what to do once the spill has been reported. For most trainees, that means evacuating the area. The MSDS also contains another kind of emergency information— recommended first-aid measures for most chemicals. You should check the MSDS before working with a chemical so you’ll know what to do if you have a direct, unprotected exposure. For chemicals in the eyes, the MSDS will generally recommend flushing with water for 15 minutes and then seeing a doctor. For chemicals on the skin, the advice is generally to wash with soap and water and continue flushing the affected area for 15 minutes. But remember, some chemicals react with water. If that’s the case, you need to know before you wash or you could do more damage. A follow-up visit to the doctor is also usually recommended for contact with strong chemicals or chemical burns. Moving someone who has inhaled chemical vapors into fresh air is recommended in almost every MSDS, along with a follow-up visit to the doctor. The MSDS will also tell you if it is safe to give artificial respiration to a victim who has stopped breathing. 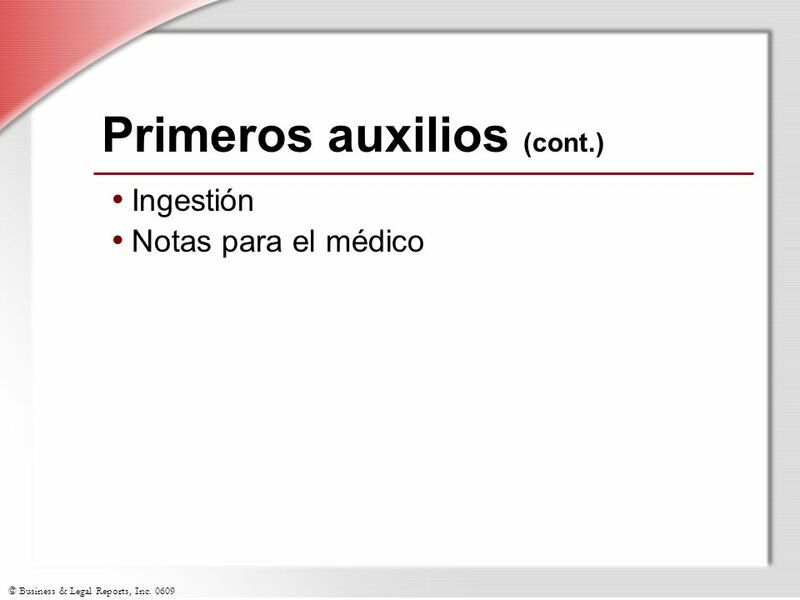 Ingestión Notas para el médico Slide Show Notes Although no one would intentionally swallow a hazardous chemical, it could get into your system accidentally, for example, if after handling a chemical you forget to wash your hands before eating or drinking or if you wipe your mouth with chemicals on your glove. If you should ingest a hazardous chemical, the MSDS will recommend the proper response. Generally, you should seek medical attention right away. In some cases, the MSDS may recommend drinking a lot of water or milk, and not inducing vomiting, which could cause more damage as the chemical comes back up. Almost every MSDS has some notes to doctors, recommending treatment methods, including whether antidotes are necessary. The doctor can also use the manufacturer’s emergency number. Always give emergency medical personnel a copy of the MSDS. Think about what you should do in a medical emergency involving a hazardous chemical. Discuss your facility's emergency medical response procedures. Make sure trainees know whom to call for assistance and where first-aid kits, emergency showers, eyewash stations, and so on are located. ¿Entiende toda la información presentada en las diapositivas anteriores? Slide Show Notes Now it’s time to ask yourself if you have understood the information presented in the previous slides about the content of the MSDS. It is important for your safety and health that you understand this information. Answer any questions trainees have about the information presented in the previous slides. Conduct an exercise, if appropriate. Some MSDS formats may contain additional content. Let’s look at that information now. 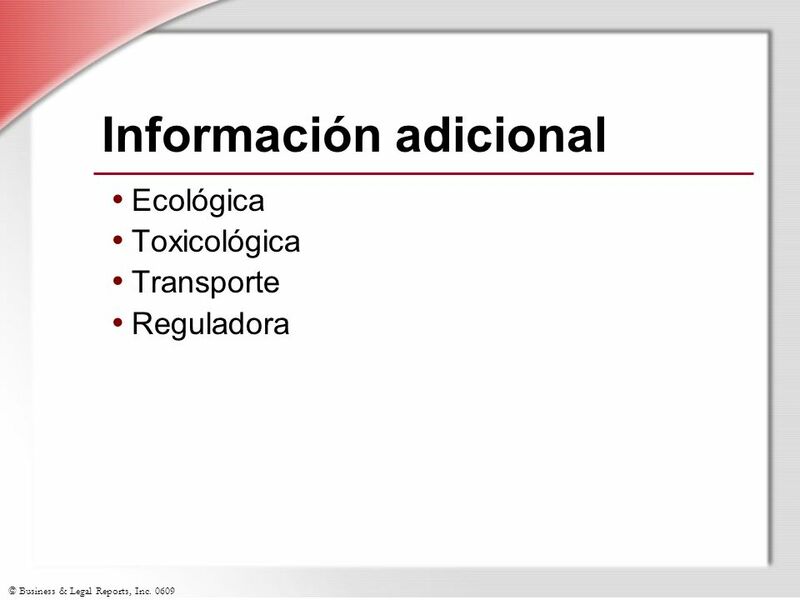 Ecológica Toxicológica Transporte Reguladora Slide Show Notes Some MSDSs may contain additional useful information. For example: Information about how the chemical could affect the environment, including plants and animals; How the chemical was tested for health hazards and test results; Essential shipping information; and OSHA, EPA, or other regulations that apply to the chemical or state reporting requirements. 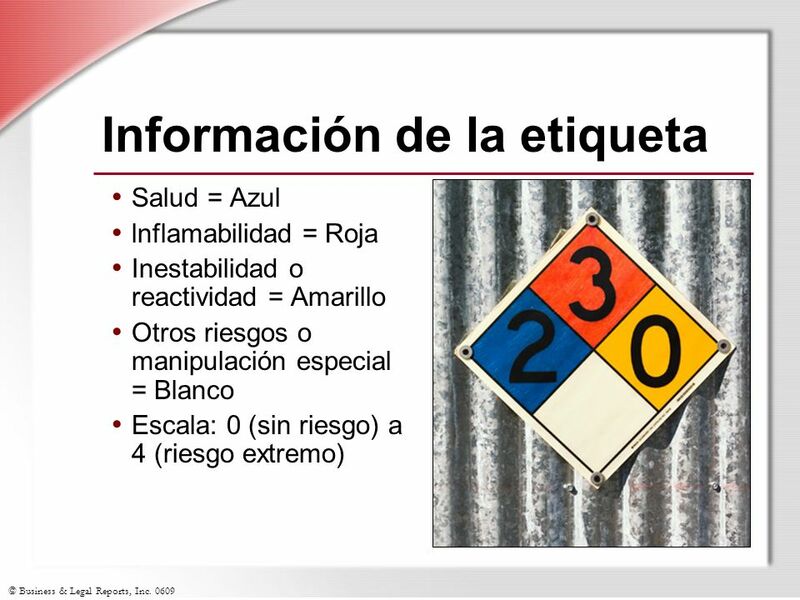 Salud = Azul lnflamabilidad = Roja Inestabilidad o reactividad = Amarillo Otros riesgos o manipulación especial = Blanco Escala: 0 (sin riesgo) a 4 (riesgo extremo) Slide Show Notes Finally, some MSDSs may also provide a copy of the chemical’s label. These labels will generally follow a color- and number-coded warning system such as those developed by the National Fire Protection Association and the Hazardous Material Information System. Label information may appear in different places depending on the manufacturer—sometimes on the last page, sometimes up front, and sometimes along with the health or fire hazard information. Some manufacturers will provide a diagram of colored diamonds or bars with numbers. The colors identify the hazard and the numbers tell you the degree of hazard. Other manufacturers just put a number next to the word “health,” “flammability,” or “reactivity.” And some just say something like “HMIS H1 F3 R0,” which indicates the chemical has a health rating of 1, a flammability rating of 3, and a reactivity rating of zero. Remember, the higher the number, the more severe the hazard in that category. Think about the labels on the containers of chemicals you use. Are you familiar with the hazard warning system they use? Review the hazard warning system used on your container labels. 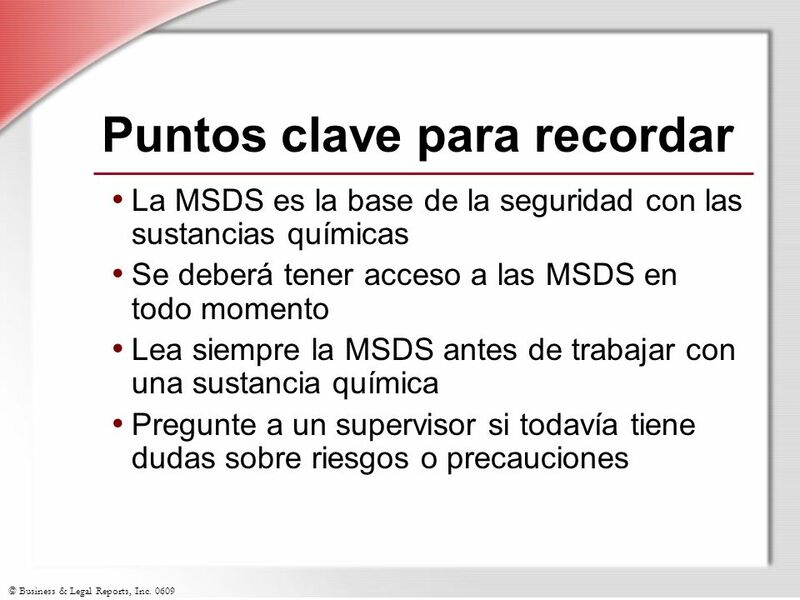 La MSDS es la base de la seguridad con las sustancias químicas Se deberá tener acceso a las MSDS en todo momento Lea siempre la MSDS antes de trabajar con una sustancia química Pregunte a un supervisor si todavía tiene dudas sobre riesgos o precauciones Slide Show Notes Here are the main points to remember from this session on the MSDS: The MSDS is the foundation of chemical safety in the workplace. MSDSs must be accessible to you at all times. Always read the MSDS carefully before handling, storing, or disposing of any hazardous chemical. Be sure to ask a supervisor if you still have any questions about hazards or precautions after reading the MSDS. This concludes the Material Safety Data Sheet training session. Give trainees the quiz, if appropriate. 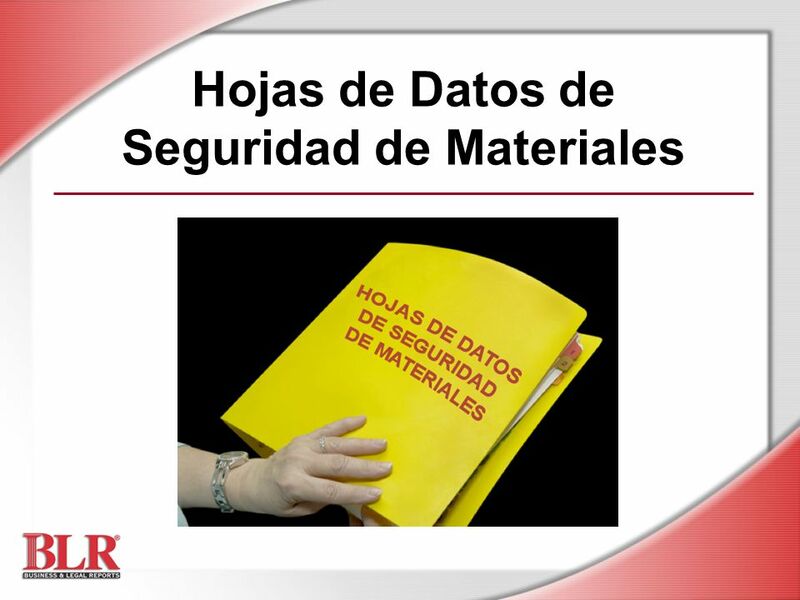 Descargar ppt "Hojas de Datos de Seguridad de Materiales"
Comunicación de Riesgos (Información sobre los riesgos de los productos químicos) (Hazard Communication) Welcome to Hazard Communication training based.